On Easter Sunday, two thousand years ago, the cosmos reverberated with the rhythm of love. The resurrection of Jesus is the most welcoming event in human history. We extend that welcome, to you. Join us as we ponder the mystery that death doesn't have the final word: Love Does. Location: 5710 22nd Ave NW, Seattle, WA 98107 (we meet in the historic chapel at St. Luke's: corner of 22nd & 58th across from Ballard Commons Park). Parking: We share a small lot with St. Luke's or street parking. On Easter, parking will be a big challenge. We encourage you to plan to be 15 mins earlier than normal. There are lots [paid and free] all around us in Ballard). Kids: Yes. Check-in is in the building directly to the south, near the corner of 22nd & 57th. Kids can check in as early as 10:15am. Pangea Kids programing is for babies/toddlers—Pre-K.
Join us on Friday at 7pm for a combined worship gathering with our friends at St. Luke’s Episcopal Church. We will meet in the chapel to remember the self-sacrificial love of Jesus, displayed on the cross. to inspire others in the way of love. No worship gathering on Feb 10th due to snow and ice. 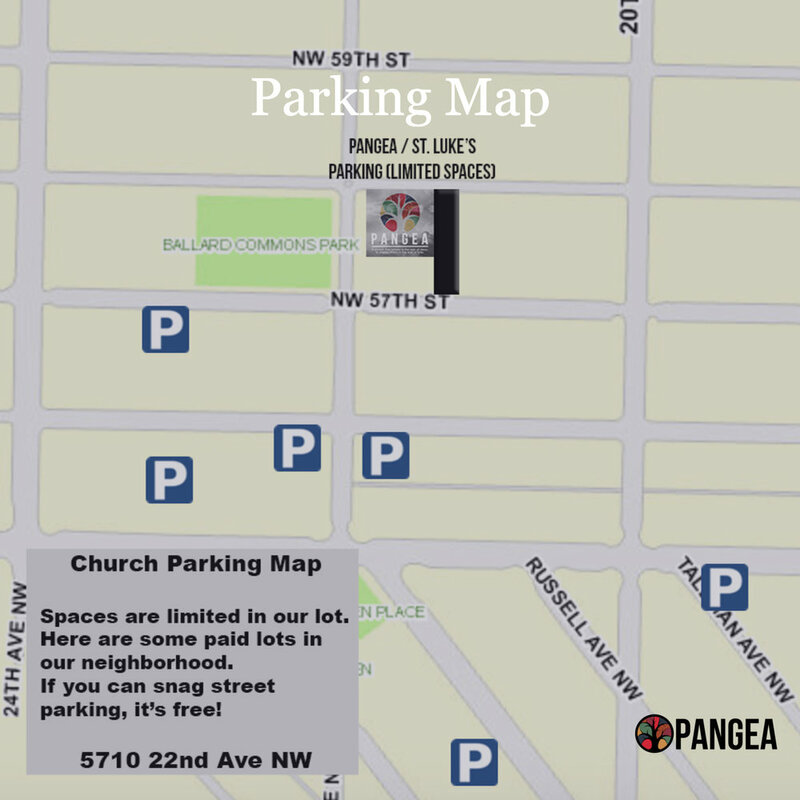 Parking: We share a small lot with St. Luke's or street parking. See the parking map for some suggested paid lots as well. Plan ahead! Kids: Yes. Check-in starts @ 10:15am. Pangea Kids programing is for babies/toddlers—5th grade. we have a seat for you. Our worship environment is at the intersection of the casual and the sacred, the contemporary and the ancient, the charismatic and the contemplative, the evangelical and the progressive. Join us as we worship authentically, ask hard questions, hear an inspiring message from the Scriptures, and connect with others who are on a journey to inspire love in our city. You belong here. A Village is a midweek group of 10-20 people committed to following in the way of Jesus as a spiritual family. They learn what it means to care for and encourage each other in a lifestyle of peacemaking and spiritual transformation. Family. It makes us ‘feel’ things. Being a part of a family isn’t always easy. In fact, it can be downright difficult at times. “Family Feels” is a series that looks at some of the challenges and expectations people have in their pursuit of peaceably loving and living in a family. We will also take note of the kind of family that Jesus ultimately recognizes above our biological ties: the community of faith that does the will of the Father. No matter our struggles with our physical family, the church is invited to be a spiritual family that reflects the goodness of God. Here’s a video to give you a feel for a Sunday morning sermon.